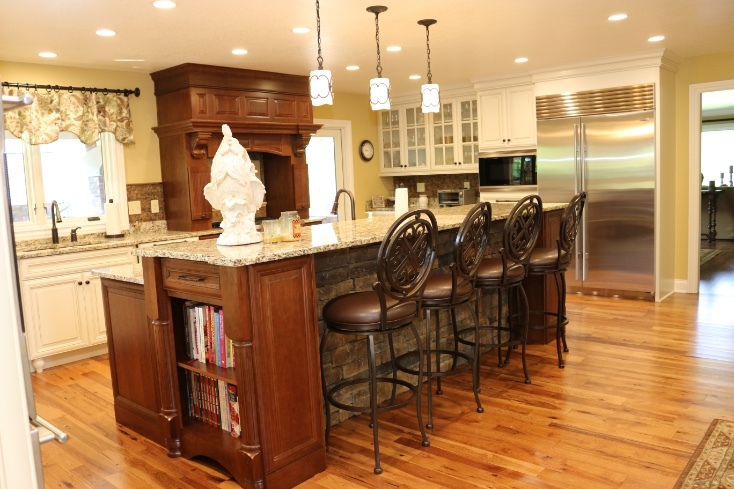 Are you looking to do a kitchen remodel or build a custom home? If so, here are our favorite cabinet accesiories you should defintely consider! 1. Wood Tiered Cutlery Tray. 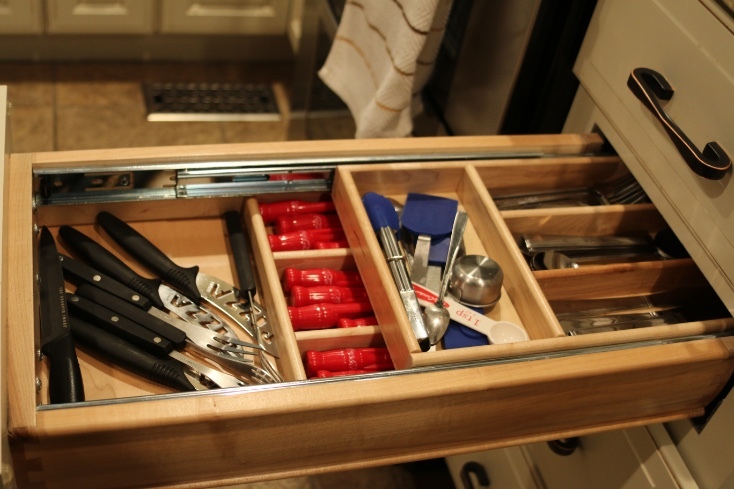 This tray takes the same amount of space but doubles the storage! 2. Pull Out Waste Basket. 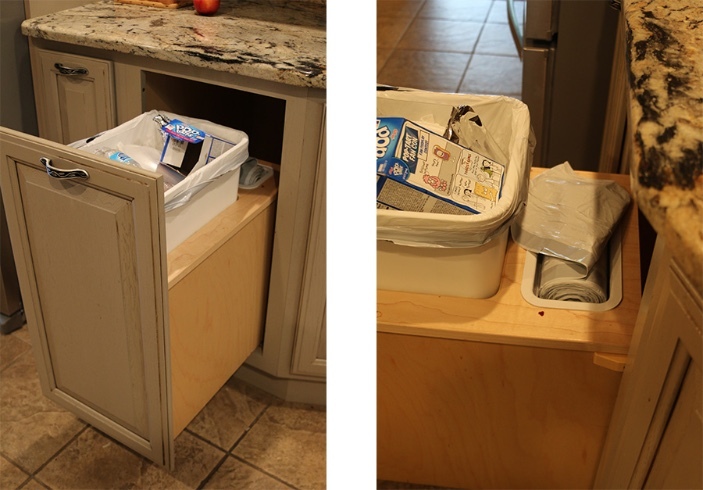 Now not only can your trash can be hidden, but no more digging under the sink when it's time for a new trash bag! Tired of looking for a convienient counter spot for your stand mixer, toaster or other small appliance? This garage gives the perfect, neat corner but keeps your appliances close by for use. Does anyone else feel like they're playing an inevitable game of Jenga every time they go to get a pot or pan? 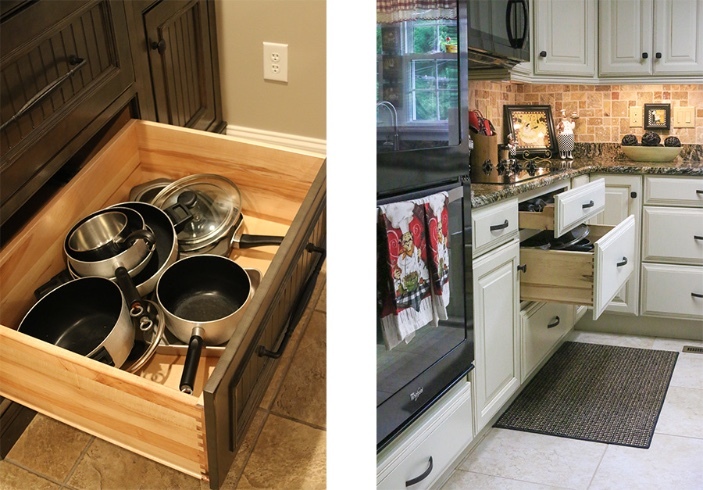 This deep drawer makes storage easy and is especially convenient when located directly under the stove (as on the right). Speaking of pans... this peg pullout is a must! If you are not digging for trash bags under this sink, you're likely searching for a particular cleaner that you need right away. 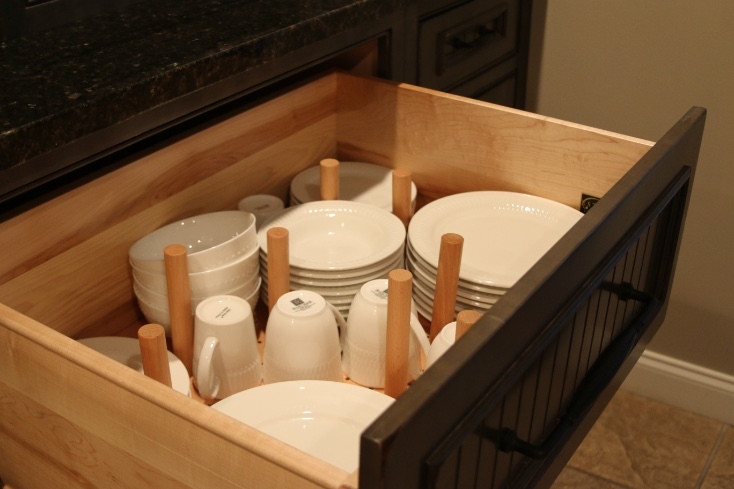 This U-drawer keeps your under sink area organized and still leaves room for all those pipes. 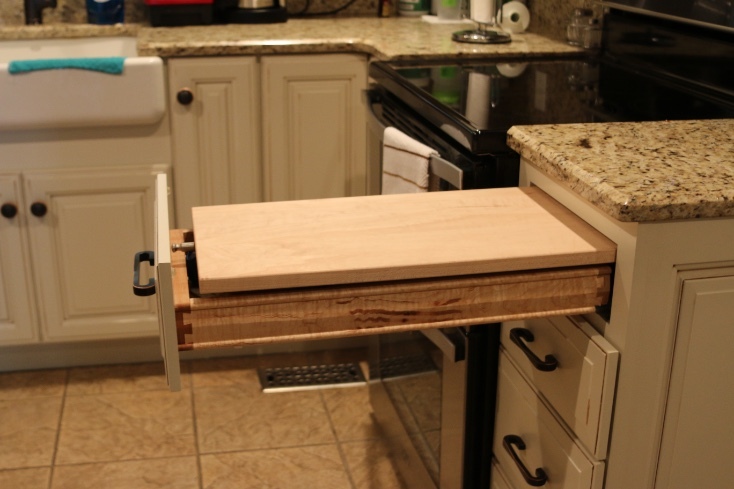 This knife divider with a cutting board on top leaves more counter and storage space! No fear, the cutting board pulls right out for cleaning and special cutting. This is great safe way to store your glassware sets. Adjust the corks to fit your exact needs! Spice storage can be so annoying... especially if you don't want them on your counter top. 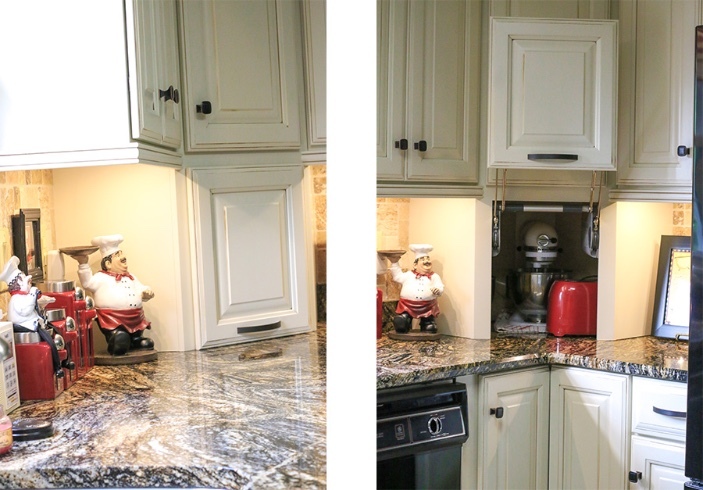 This is a great solution to keep them hidden from view but also at easy access. If you are someone who still loves to have cookbooks on hand, they probably end up shoved in a drawer somewhere. This cookbook shelf makes the perfect spot and does not steal any kitchen storage! What would be your must-haves? 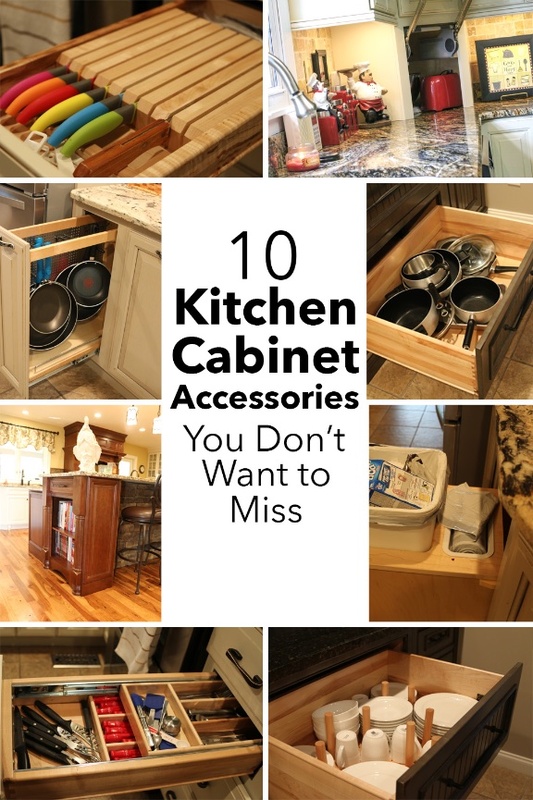 Any other great cabinet accessories you would add to this list? All photos taken by Twin Enterprise of clients' homes or our showroom. We are able to offer custom cabinets through our partnership with Wellborn & our new company Appalachian Millworks & Cabinetry. Most featured above were produced by Wellborn. Please do not use these photos without giving proper credit. 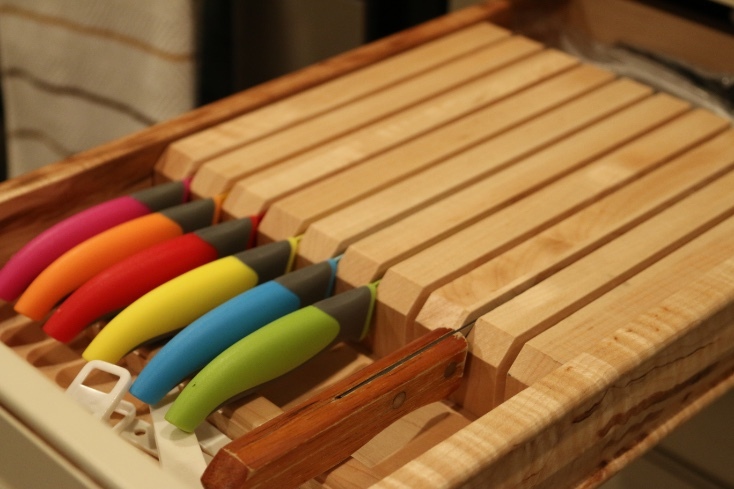 Rosie - I have used many appliances but I have never seen a cutting board like this. Luca Nicholson - Very informative article. I think it will help those who started their newly family life. Siaosi - There are some incredible ideas that I am definitely going to put into my kitchen. Like who actually thinks of putting a book shelf in the kitchen for cook books. I think that It would become very useful and would help make it more accessible to use. Kenneth Gladman - I have never seen a U shaped drawer, that is quite interesting. My wife and I are remodeling our kitchen this summer and are looking for cabinet ideas. We would love to have custom cabinets and become more organized. Charles Kemp - I don't think I have ever seen cabinetry accessories before. 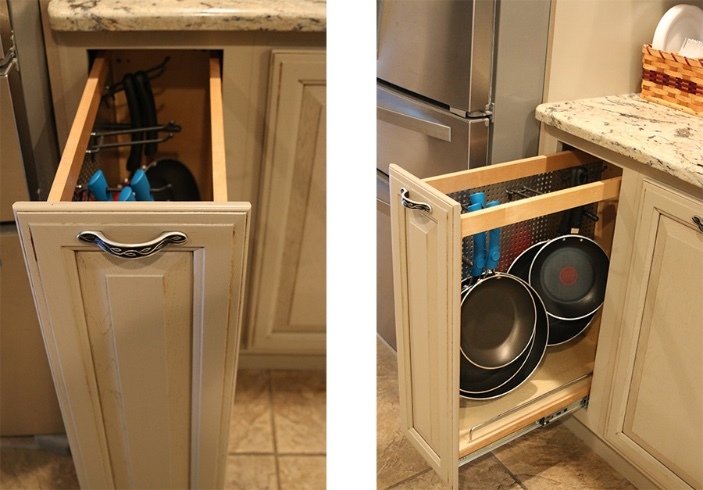 This would be really cool to have especially if you have custom cabinetry in you home. What I really like is that you can have these little accessories applied to your cabinetry.